Now is the season to let go of perfect, sleek hairdos and embrace that loose, natural look. Here are some tips to protect your hair from the heat, sun, and humidity without turning it into an endless battle. Use a scarf or hat to cover your head when you’re out in the sun for long periods of time. Not only does this provide extra UV protection, but it also helps your scalp to retain moisture. It also reduces damage caused by wind, especially if your hair is prone to tangling, and protects colour-treated hair. A messy braid is ideal for keeping your hair under control and minimizing exposure to the sun. If you hair is already on the dry side, a tight hairstyle can be damaging because they tend to pull the hair. Frequent washing strips your scalp of its natural oils, which stimulates oil production and makes you feel the need to wash it even more. Try just rinsing in the shower after a day at the beach or pool, and see if that gets rid of some extra oil. Use dry shampoo in place of regular shampoo to go a bit longer without washing. You can also dab a cotton ball soaked in witch hazel along your scalp to dissolve excess oil. Try to blow-dry your hair as little as possible. 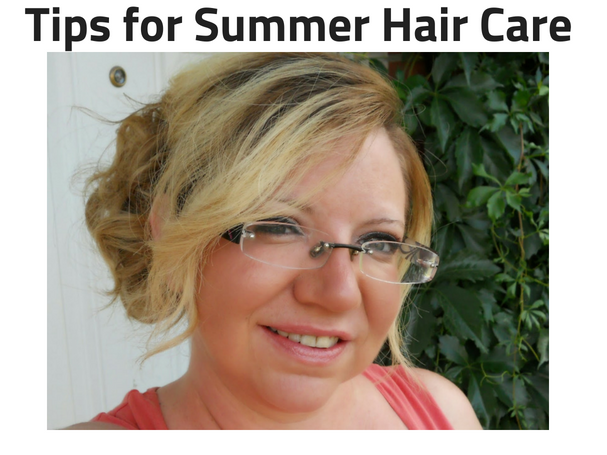 It is already exposed to a significant amount of heat on a daily basis in the summer, and it will probably air-dry quickly anyways, so give the blow dryer a break and go au naturel if you can. Check out my blog post for Tips to Air Drying your Hair! Mix water, aloe vera juice, and avocado oil in a spray bottle to spritz whenever a bit of moisture and/or control is needed. You can also mix Argan Oil and water. Rinse with apple cider vinegar diluted in water for a quick natural conditioner. Use some Coconut Oil to smooth, de-frizz, and moisturize hair after washing. The oil will give hair some shine and, if you have wavy hair, create natural, air-dried curls. Try a deep conditioning hair treatment once a week to get that extra bit of moisture into your hair. If you have blond hair that tends to turn green after a swim in the pool, try rinsing out your wet hair with ¼ cup apple cider vinegar and 2 cups water to get rid of discoloration and dullness. It also helps to wet the hair before entering the water because then it won't absorb as much chlorine. There are shampoos that contain UV protection, but most of those are full of chemicals that can dry out the hair more so I recommend avoid using them. One quick way to add some protection to the hair is to run your hands lightly through your hair after applying sunscreen to your body. Coconut, Olive, and Avocado oils are good at penetrating deep into the hair shaft. Shampoo hair as usual and then work in the oil from ends to roots. Your hair should feel moisturized but not greasy. Make a homemade Sea Salt Spray with 1 tsp sea salt, 1 tsp coconut oil, and mix with water in a small spray bottle. Spray and scrunch to get that desirable wavy beach look. The coconut oil will counteract the dryness of the salt. You can also try my favorite Sea Salt Spray, Clean Enhanced Organics Surf Spray! Avoid pulling anything through your hair when it’s wet, because that is when hair is most susceptible to breaking.